“The Wolves” follows a high school girls’ soccer team through their warm-ups before a series of weekly soccer games. The play opens Friday and will run through Saturday at the Hal & Martha Hyer Wallis Theater. When getting ready for a soccer game, the warm-up is the most important part. 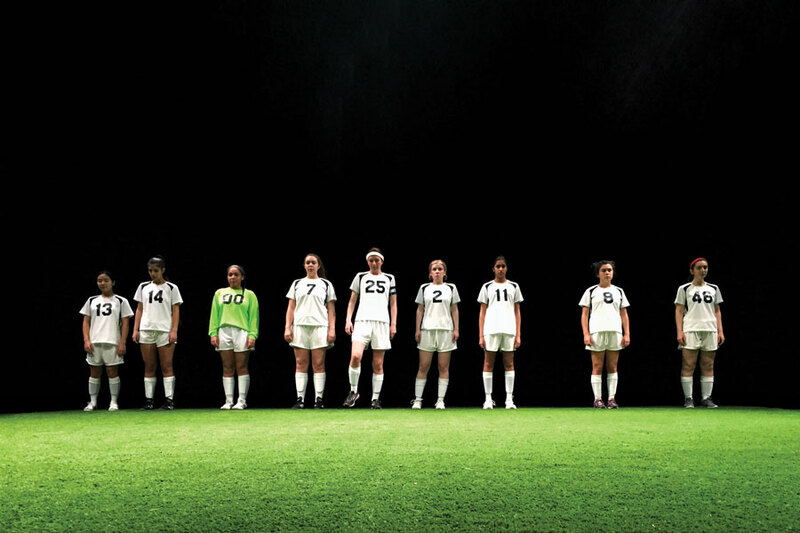 It’s also the focus of Sarah DeLappe’s “The Wolves,” a play about the inner workings of a high school girls’ soccer team. “The Wolves” opens Friday and will run through Sunday at the Hal & Martha Hyer Wallis Theater as a part of The Wirtz Center for the Performing Arts’ MFA Lab Series. Director Sarah Gitenstein said the play follows the team through their warm-ups before weekly soccer games, illustrating how their outside lives affect their performance on the field. Gitenstein is a second-year student in Northwestern’s MFA in Directing program. She said she chose to direct “The Wolves” for a program requirement because the play highlights the overlooked challenges of being a young woman in today’s world. Gitenstein said the play uses conversational language to tackle big issues of how young women are expected to navigate the world. She added that the language demonstrates how women engage with each other socially in all-female spaces. When the cast is casually talking during rehearsal, Gitenstein said she hears the play echoed in the actors’ conversations when they interact in the same way their characters do. Kwon plays one of the girls on the soccer team, #13, in the show. She said she is excited that her first production at NU shows girls being strong. The freshman said she has seen a lot of movies about male athletes who find brotherhood in their sports teams, but similar stories about women are harder to find. As part of the rehearsal process, Kwon and the rest of the cast attended workshops run by NU women’s soccer assistant coach David Nikolic to develop soccer skills. Along with lessons, the actors were given drills to do on their own. Kwon said she had never played soccer before the rehearsal workshops, so the prospect of learning a new sport added an extra challenge to the process. At this point, she said she probably wouldn’t fare well on a soccer team, but she is more comfortable with the sport. Scenic designer and third-year MFA student Scott Penner said the entire show takes place on a soccer field, which has posed difficulties for the design team. “One of our biggest challenges is actually trying to control rogue balls that are hurtling toward the places of audience members if there’s a miskick,” Penner said. Penner said he and the rest of the design team visited a soccer field before production began to better understand how to develop a set. The most expensive endeavor was purchasing enough turf to cover the entire stage, he said. The scenic designer said “The Wolves” is especially relevant to NU students, who are in a similar age demographic to the show’s characters. “It’s a really beautiful honest piece about growing up as a young woman in America and what that means now,” Penner said. Correction: A previous version of this story misstated the dates of “The Wolves.” The show runs Friday through Sunday. The article also misstated the name of the NU women’s soccer assistant coach who ran rehearsal workshops. His name is David Nikolic. The Daily regrets the errors.